A construction worker has died of injuries he sustained when a wall collapsed at a primary school. 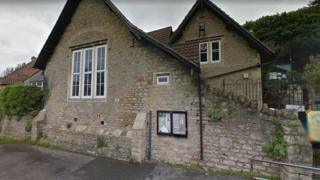 The man, who has not been named, was working at Swainswick School, near Bath, on Tuesday morning when the collapse happened. He was taken to Southmead Hospital by air ambulance but died the following day. Avon and Somerset Police said a joint investigation with the Health and Safety Executive (HSE) was under way. The wall was being built in a segregated construction site on school grounds. Police said no children witnessed the incident. Bath and North East Somerset Council, said: "The HSE has concluded that the school is safe for children, staff and parents. "The council is providing support for anyone at the school who may have been affected by the incident."